Zucchini Noodles Salad. A fresh zucchini noodle salad with tomatoes, zucchini, and avocado tossed in a lemon basil vinaigrette. Perfect for summer! Who’s ready for all things summer? The grill. The beach. The sun. The BBQs and the s’mores. The pasta salads. I am and I am also ready for all things fresh summer veggies. I can’t wait for all the summer squash and sun ripened tomatoes so that I can make this Zucchini Noodles Salad over and over again. With fresh zucchini noodles, tomatoes and avocado all tossed in a lemon basil vinaigrette it is like summer in a bowl and will be your new go to salad this summer too. I just know it. A lot of the recipes that I see for zucchini noodles involve cooking them for a short amount of time. But I wanted to try a recipe using raw zucchini noodles. 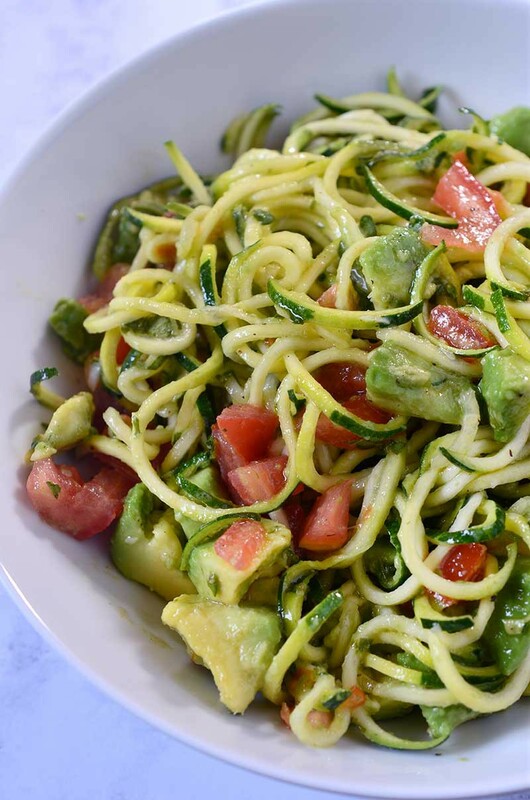 After all, summer is coming and you’ve got to have some no cook recipes in your repertoire and this Zucchini Noodle, Tomato & Avocado Salad is perfect. This Zucchini Noodles Salad Recipe uses my favorite new kitchen gadget: my spiralizer. I first wrote about it when I made these Sweet Potato Noodles and I thought I loved it then. Truth be told, as much as I loved those sweet potato noodles, I could not wait for the chance to make some gorgeous summer salads with my spiralizer. I mean, after all, we eat with our eyes too don’t we? And seriously, spiralized vegetables are so gosh darn pretty. Summer Spiralized Salads = delicious AND pretty. But what if you don’t have a spiralizer? Well, I’m going to solve that problem for one of you. Because I’m kind of obsessed with mine and think everyone should own one, I am going to give one away. A Paderno Tri-Blade Sprializer to be exact. It is the one I use in my kitchen and I love, love, love it. All you have to do to enter is leave a comment in the comment sections below telling me your favorite summer vegetable and I’ll pick a winner at random. Giveaway ends Friday May 29 at 5:00PM PST. Winners will be picked at random and must respond within 48 hours or I will have to pick another winner. Combine olive oil, lemon juice, garlic and basil together in a food processor and process just until emulsified. Season to taste with salt and pepper. Set aside. Using the 1/8 inch spacing blade, cut the zucchini into noodles. Place zucchini, tomatoes and avocado together in a bowl. Drizzle dressing over the top. Cover and refrigerate for 20 minutes. Serve. I brought the salad to a BBQ and it was an absolute winner. Thank you! Zucchini for sure. It is so versatile. I have 4 plants started. But I also love tomatoes of all varieties, eggplant, cucumbers, fresh herbs, etc I could go on and on. I need a spiralizer! I live on zucchini noodles in the summer and doing them by hand is a little tedious. And I’m trying this recipe tonight! It is exactly what I was looking for. I’m pairing it with grilled ahi. Zucchini is my favourite….for baking breads, cookies, etc….as a raw veggie or baked/boiled….for me it was a childhood vegetable….always grown in our family’s garden! Dill, technically a summer veg., but if not, then definitely Chile Peppers – Preferably Serrano and Jalapeno. My favorite summer vegetable is asparagus. My next favorite is sweet corn on the cob. Both are so yummy!! This would be perfect for us to eat! We’ve been doing Whole 30 and can’t wait to try this! I love your recipes! My favorite veggie from our garden is green beans, and the kids love the peas. Happy cooking! My favorite from my own garden is tomatoes but I also love sweet corn on the cob!! Tomatoes are my absolute favorite garden produce, but cantaloupe comes in a close second. I agree with Pam – there is so much you can do with a tomato. A sweet cantaloupe allowed to ripen on the vine is divine – like eating candy! I would use with Summer squash-love it! Zucchini is definitely my favorite summer vegetable. There’s just so much you can do with it! Homegrown string beans are the best! Sweet corn! Risotto made with sweet corn is a summer favorite! Hands down, there is absolutely nothing better than a summer tomato —- any kind!!! They are devine raw, sliced with kosher salt, stuffed with anything from zucchini (spirals!!!) to shrimp, stewed, roasted, and the best, a BLT!!!! On me, can’t wait. Looks Amazing! Can’t wait to try this! Thanks so much for all your great recipes. Tomatoes from the garden for sure! Summer (yellow) squash and zucchini are both runner ups for me. Love it grilled with garlic and butter. I love them all BUT my favorite has to be our home grown tomatoes! Mmm Mmm Good! And right off the vine is even better when they are still warm from the sun! Zucchini is so versatile and delicious in any recipe. My favorite summer vegetable is Grandpa’s green beans….grown in his backyard with love. I grew up picking beans fresh off the vine for dinner or jarred for use in winter. I’ve tried growing the same brand and variety but my patio garden doesn’t have the years of careful crafting my grandparents’ half acre offers. Grandpa is no longer with us but Grandma is doing her best to keep his beans going. There is nothing better than fresh garden green beans, no butter or salt required. This recipe looks fantastic. Thank you for your giveaway. My favorite summer vegetable is zucchini. There are so many things you can do with it. Yum! I have two growing boys. Your salad will be fabulous for the summer. thinly sliced basil. I can’t wait! I live for fresh, garden grown tomatoes and zucchini! Or basically any grilled veggie during the summertime! “sweet 100s” cherry tomatoes are my favorite summer veggie, and I cannot wait to try them in this recipe with my new spiralizer. Too many to list, but corn is up there. I love the bounty of summer veggies! I’m particularly fond of both zucchini and sweet potatoes. It is definitely a tossup between zucchini and tomatoes! I am dying for one of these Spiralizers! I seriously can not get enough sweet potato and will eat them anyway from now until Sunday lol. My husband thinks it is gross that I eat them cold and raw sometimes, but I just smile and eat them anyway. I NEED to spiralize one :)…. My favorite summer veggie is sweet corn though… On the grill with lime and cilantro sprinkled after… Yum! This recipe looks awesome. My favorite summer vegetable has to be zucchini! Oh definitely zucchini, though yellow squash is a close runner up! My favorite summer veggie is zucchini!! This is a gorgeous summer salad! The dressing sounds wonderful. My favorite summer vegetable is definitely peppers! I keep on seeing this spiralizer machine every where and now I want to get one! Tomatoes! Can’t beat vine ripened tomatoes from my garden. Corn on the cob! Especially cooked on the grill! What a delicious looking summer salad! Looks yummy! My favorite summer vegetables are grilled zucchini and squash!! This salad looks so fresh and appetizing on a hot summer day or night! A must try!! My fav summer vegetable is a toss up between corn and zuccini. Love em both! That looks delicious! My favorite summer vegetable is tomatoes straight out of the garden or farm stand. The flavor is so much fuller. Part of my is ready for summer and part is not. I am looking forward to the delicious veggies that are in this salad. I love grilling zuchinni! Basically anything with zuchinni. Or avocado! Love all your recipes, nothing ever disappoints!